Xiaomi is doing everything they can in order to reach their goal for this year. The company is expecting to sell between 80 and 100 million smartphones in 2015, after they managed to ship out 61 million last year. This Chinese smartphone OEM has revealed a range of devices this year, the majority of which were smartphones. The Redmi Note 2 and Mi 5 are expected to be announced in the next couple of months, but before that happens, Xiaomi had something else to share with us. China’s biggest smartphone manufacturer has announced their Yi Action Camera back in March. This small action camera is a direct rival to the GoPro, and was priced at only 399 Yuan ($64) at launch. That small gadget has been available for purchase for quite some time now. 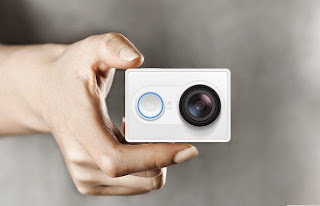 The Yi Action Camera is not the only Yi product Xiaomi has announced though, the company has announced the regular Yi Smart Camera a while back, and they’ve now announced yet another variant of it, the Night Vision Edition of the Yi Smart Camera. 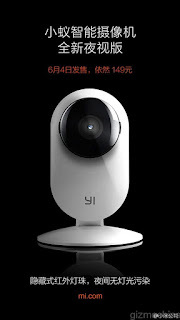 This device actually looks identical to the Yi Smart Camera, as you can see in the provided image. Anyhow, this camera actually sports a 940mm infrared camera sensor, which should allow it to take nice shots in night conditions. Other than the infrared sensor, there’s nothing that differentiates this thing from Xiaomi’s Yi Smart Camera we’ve mentioned above. The Night Vision Edition of the Yi Camera will cost 149 Yuan ($25), and it will be available starting June 4 directly from the company’s official Chinese site. We still don’t know if Xiaomi intends to offer this product in any additional countries, but one thing is for sure, it will be available in China first, as usual. There you have it folks, a new Xiaomi product is going to be available soon as we’re waiting for the announcement of the company’s new devices. The Redmi Note 2 is quite probably going to launch before the Mi 5, which means you can expect Xiaomi to announce it in the next couple of weeks. We’re still waiting for some new info from China, and as soon as we manage to dig some up, we’ll let you know. As a side note, Xiaomi is expected to announce the Air Purifier on June 10, so stay tuned for that.